Irtiqa: Should we worry about the Creation museum in Kentucky? Should we worry about the Creation museum in Kentucky? Views about fossils have come and gone. But fossils themselves do not tell us where these creatures come from or how they died. Fortunately we have another source of factual data—the first book of the Bible, Genesis. This book makes it obvious that carnivory, disease, and death, as seen in the fossil record, came after sin. So the fossil record had to be formed after sin entered the world. 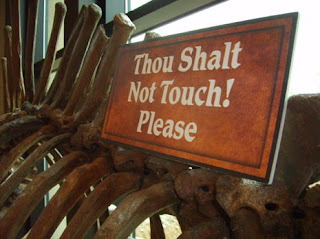 It hardly matters that the Creation Museum is bound to appall secular visitors. They are not its audience. It exists to tell Christianist families that they are right and the future is theirs. Most of the families—overwhelmingly white, mainly blond, and about the most pleasant, cheerful collection of tourists imaginable—seemed to accept what they heard and read as they were coaxed along the explanatory trail, with the children delighted by the cleverly designed animal displays. This expensive frolic through a sinister fairy tale was made for the young. I don't know how to approach this topic without giving unnecessary publicity to Ken Ham and his brand of creationism - perhaps evoking dystopian imagery is the only way to go.